Today, I have another sneak peak of an upcoming new product in the Occasions Catalog. This was a birthday card that I made for the OnStage Display earlier this month. This new Party Animal Suite is pretty fabulous. 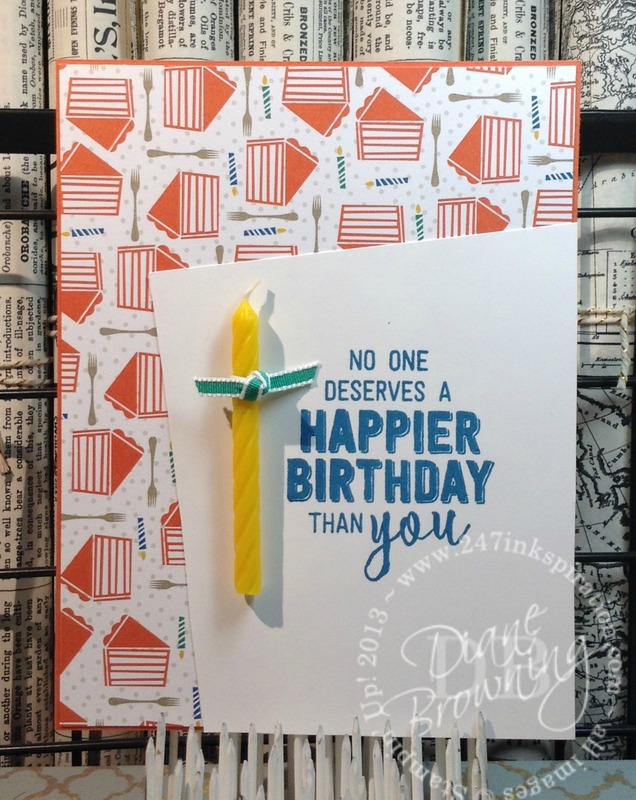 I love the bright, bold pattern papers and the Balloon Adventures stamp set has some great sentiments included. This card is a relatively simple design. The pattern on the paper is so big that I wanted to keep it my focal point but I needed something to tone it down just a bit. Adding the layer of whisper white on top helps give your eyes just a bit of a rest. I layered it at wonky angle because I thought it fit with all the wonky angles on the birthday cakes. This might be a better card for hand delivery. I’m not sure how that candle would do in the mail. But really think the real candle adds a nice touch. And the recipient can remove the candle and use it on their cake if they wished. Today is the last day for the November Specials. Unfortunately, the Stitched Shapes Dies are on backorder and won’t be available until another shipment is received, likely several weeks. The stamp sets that are on sale are only for this month. Just a quick word about today’s Supply List. The Balloon Adventures, Party Animal Paper, Party Animal Embellishments, and Emerald Envy Taffeta Ribbon have not been added to the Program yet that generates these. I’m sure they are working on getting it added to the system, but there are a lot of brand new products coming and these things take time. Be patient. You won’t be disappointed.